It would be fair to assume that I do spend a lot of time in five star hotels – either lounging around, terrorizing their chefs or drinking heavily. The reasons for this are twofold – in the Middle East hotels are generally the only place a gal can drink in public and frankly, my handbag collection demands a stage. That said, I don’t mind a greasy spoon joint (hangover helper) or a quality cafe. Anywhere with good coffee, magazines and decent people watching/judging opportunities. On one of my most recent trips to Muscat, my regular partner in crime GF and I ventured out of the rarefied confines of five stardom after reading a review of Manis Cafe in one of the local rags. The cafe scene in Muscat, doesn’t set the culinary bar very high to be honest but there are a couple of favorites including Darcy’s Kitchen and the faux eclectic Shakespeare and Co at The Wave. Honestly, it was good enough to demand a repeat performance the following day. 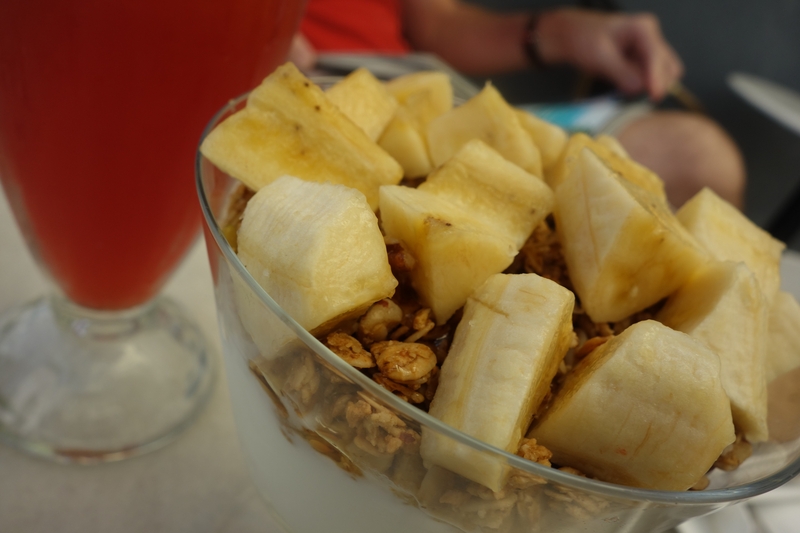 We tried items off both the breakfast and lunch menus on both trips and were beyond impressed. Straight up Manis is not going to win any awards for its location. It’s hidden in the corner of the Jawaharat Al Shatti beachside strip mall sandwiched between a phone store and another place incongruously selling Harley Davidson accessories. The view won’t win any accolades either, you had better hope your dining companion is interesting (like mine of course) because the only entertainment is watching the Muscat Hills Matrons attempting to reverse park their Porsche Cayennes in too small spots while simultaneously yelling at little Shanaya to shut the f**k up and stop hitting Destynee (actually that’s quite fun, like a Cashed Up Bogan Meets Middle East version of the Kardashians). Speaking of ladies with lots of time on their hands, this is a place that has a female following. It could be the discrete location or the distinctly girly purple and white decor, but make sure your male dining companion can handle the estrogen overload. the selection of fashion mags and the cake set up pile on the Lady-friendly environment cues. And on the issue of parking, either get their early or be prepared for the Muscat version of cruising – ie looking for a spot. Space is at a premium in this area, with its proximity to the beach and expat-friendly cafes. On both trips, thanks to GF’s superior parking spotting skills (he made me say that), we lucked out. As for the food, it’s a step above the usual cafe offerings in Muscat. Our first visit saw us take on the breakfast menu. 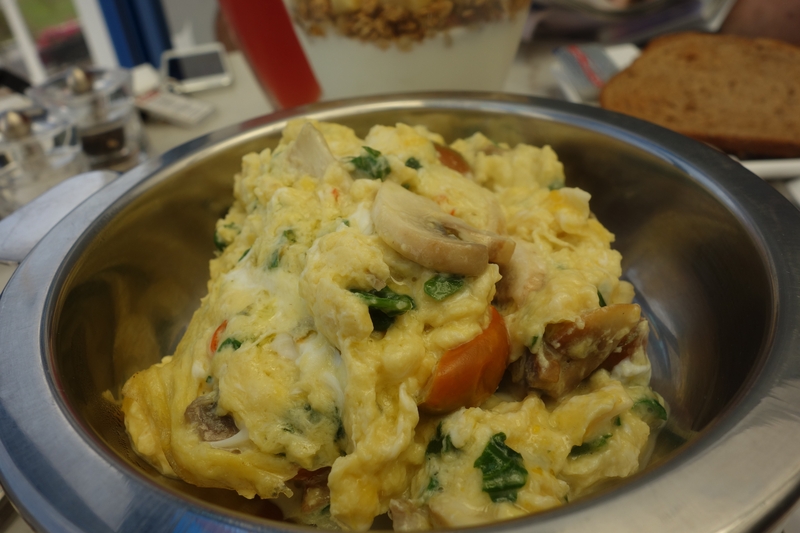 My spicy eggs was served rather extravagantly in its own warmer, with toast on the side. Creamy thanks to the inclusion of mozzarella with just a hint of chilli, it was filling and a departure from the usual rubbery eggs served in cafes in this region. 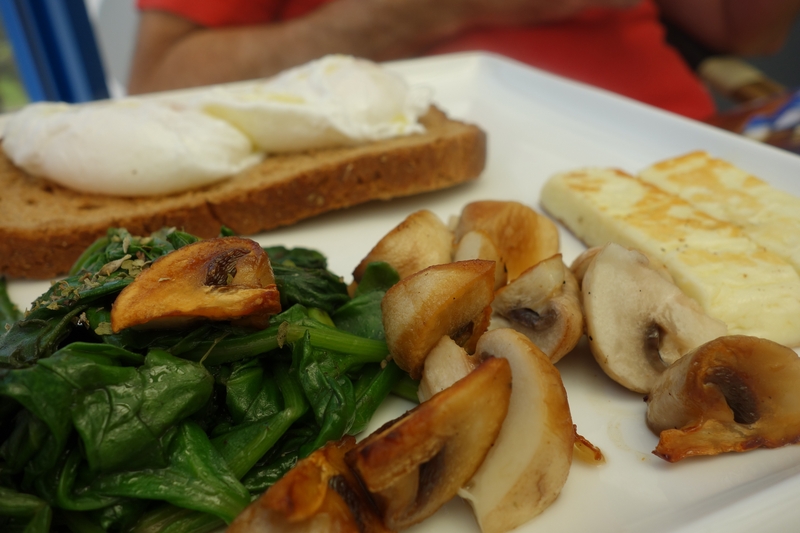 GF, always the virtuous one in this set up, opted for poached eggs and spinach. Delivered with mushrooms and two grilled hunks of halloumi, it was a protein rich extravaganza. We shared a parfait of granola with Greek yoghurt topped with banana, which was too sweet for this princess but GF enjoyed greatly. Fresh juices made to order and Illy coffee rounded out the meal. A word on the coffee. Australians are known for many things – their cricket supremacy, Crocodile Dundee and our embrace of the coffee culture. We were both excited to see Illy coffee used at this place, but this was the one misstep made in their otherwise seamless delivery. Perhaps the machine needs a clean or maybe the maker wasn’t experienced, it was a little bitter. Being creatures of habit (and the fact that GF’s unique driving skills do inhibit us – that’s another story), we returned the next day for lunch. 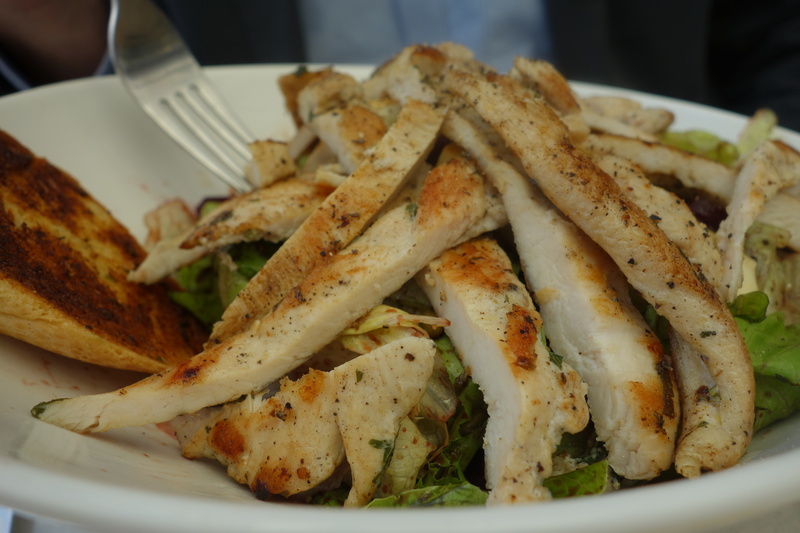 We both chose chicken dishes – GF a salad of roasted beats and chicken and me “kebabs”. 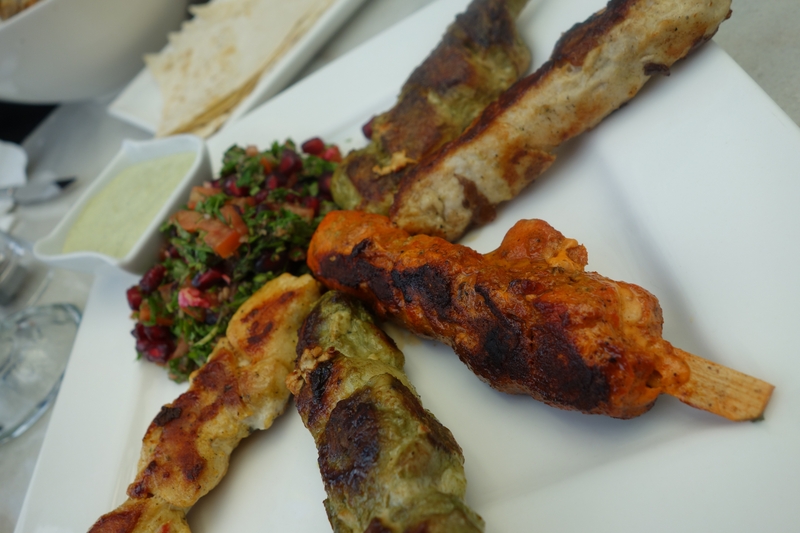 What they should have explained was that it was a “platter” of five kebabs, each with different marinades – a tandoori, coriander and a lemony one. Both dishes, in lesser hands, could have gone awry. But the chicken was tender, bursting with favor and frankly, a delight. Mine was served with a tabbouli salad that was heavy on pomegranite molasses and contrasted well with the spicy kebabs. 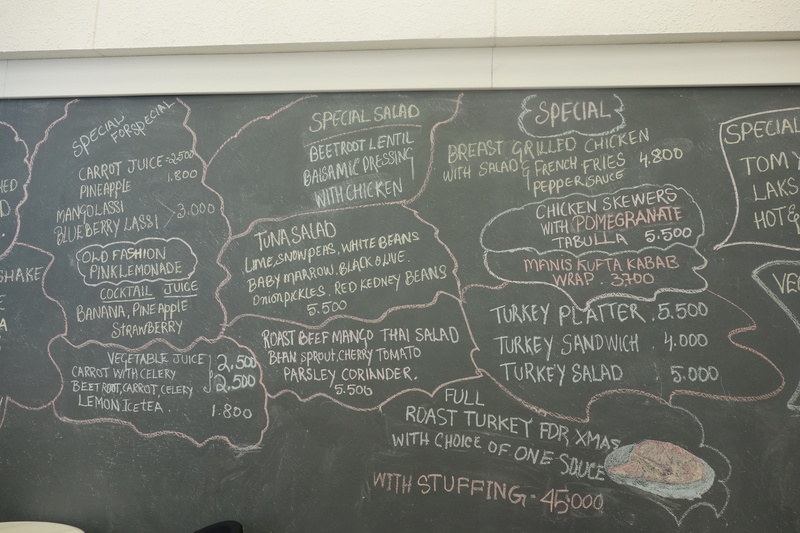 The menu is cafe compact but is supplemented by specials on the wall-wide blackboard. Be warned, servings are huge and it’s probably worth considering splitting lunch options. 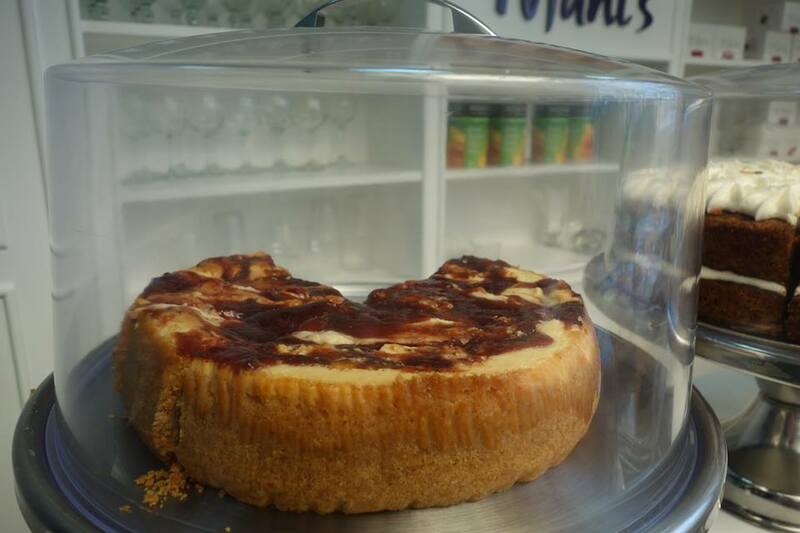 We split a slice of cherry cheesecake which was not overly sweet and charmingly creamy. The well informed waiter (we had two, both were excellent, cheerful and knowledgeable) informed us the cafe had its own pastry chef who baked treats everyday. We left on both occasions, full, happy and kind of excited we had found a new dining destination. many people don’t go beyond the Darcys Cafe and Starbucks on the ground level of this complex but Manis is worth battling your parking demons and the extra effort to find it. 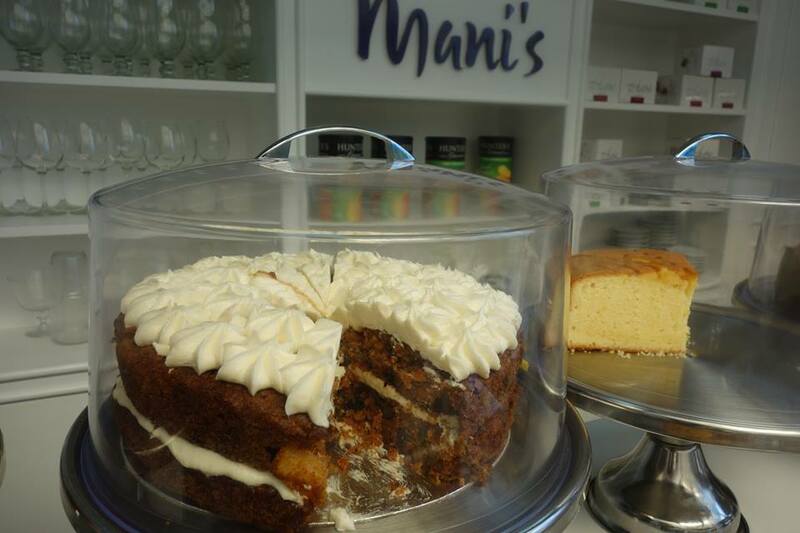 Verdict: While it isn’t reinventing the culinary wheel of cheese, Manis offered delicious, fresh and well presented food with cheerful service. Worth braving the parking lot.